− Power will only be open for Senior and Veteran competitors. The information pack for the event is available here. the Individual forms for instructors is available here. It is the participants’ responsibility to have full insurance coverage for all eventualities. The organising committee will not be responsible for any injury or loss for participants before, during, and after the Tournament howsoever arising. I trust you are all keeping in very good health, and looking forward to your Summer break. Attached please find the RITA Poster and application form to attend the official ITF International Technical Seminar (ITS) conducted by 9th Degree ITF GM Barrett to be held in the Lucan Spa Hotel from 12th -14th October 2018. Please circulate to your students and encourage them to attend and support this very special ITF /RITA event. I have reserved some rooms in the Spa Hotel €99 per night B&B per room 2 people sharing, and €69 per night for Single room B&B, please contact Betty with reference Valerie Keane (Taekwon-Do) or myself and I will make the reservations on your behalf. Should you require more information please do not hesitate to contact the undersigned. Well done to our students who represented Ireland and the CBS at the weekend; Adam Hu, Chloe Roche, Chris Yu, Daragh O’Shea, Emily Harold, Finn Howard, Kate Harold, Katie Delaney, Luca Mesolella, Niamh Davis, Oliwia Swizdor. The main goal of the CBS is to develop the students’ patterns and sparring skills for competitions and to prepare students for international competitions. It is drawn from all RITA schools and is coached by Ms Audrey Condon and Mr Adam Fox. CBS training is open to all RITA colour belts (yellow belt and above) and the coaches would love to see as many RITA students taking part. Training is usually once a month. If you are interested why not ask Master Howard for more details. 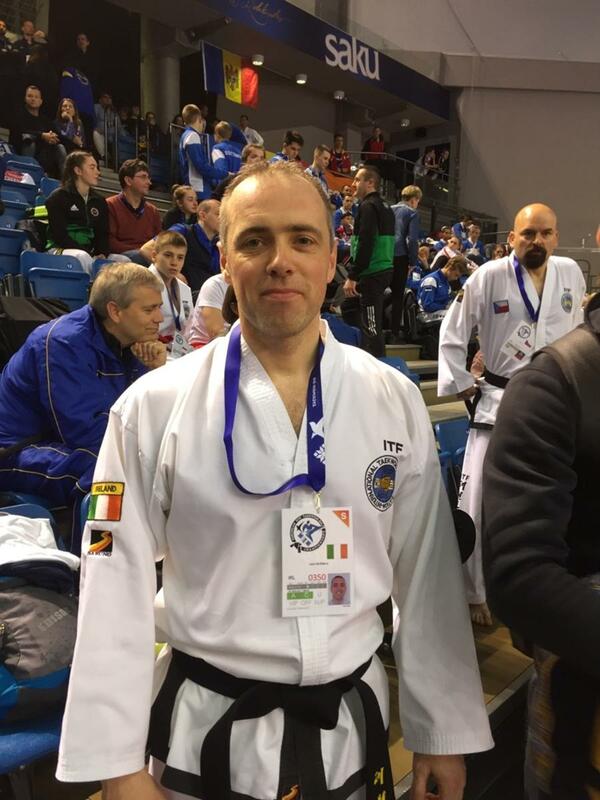 Congratulations to Mr Leon McSherry who has won the Gold medal in 5th Degree Patterns at the ITF European Taekwon-Do Championships in Estonia. Congratulations from everyone in Grandmaster Howard's Dojang. You and your students are invited to our latest sparring seminar with Mr Konstantin Yurikov from Russia. Please see details below. Tickets are available on-line.